Welcome to the 2018-2019 Season Of The Eagle Ridge Orchestras! As the Orchestra Director at Eagle Ridge, I’d like to introduce myself! I am originally from the Pittsburgh, PA area, yet spent most of my childhood in Scottsdale, Arizona. This is my 8th year teaching at ERMS. I am looking forward to seeing what this year has in store! I have a Bachelor’s Degree in Music Education from The Pennsylvania State University in University Park, PA, and a Master's in Music Education from George Mason University in Fairfax, VA. 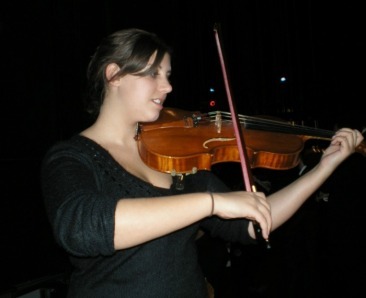 While at school, I took part in both Symphony and Chamber orchestras, and the Penn State University Viola Ensemble.. Throughout my teaching experiences, I have worked with elementary, middle, and high school. My husband and I live in Jefferson, MD, with our son - Giorgio who is 2.5 years old. I love being a parent, and can barely remember my life without my sweet boy! I don't have nearly as much spare time anymore, but when I get a chance, I enjoy reading, playing my viola, boating/fishing, traveling, and spending time with family and friends. The Arts are thriving at Eagle Ridge Middle School and I am thrilled to be a member of this department. I can be reached during school hours at (571) 252-2140, or by e-mail - Erin.Stavropulos@lcps.org . I am best reached by email. Please don’t hesitate to contact me whenever I can be of help. I am looking forward to a great musical year at Eagle Ridge and am glad that you will all be a part of it!